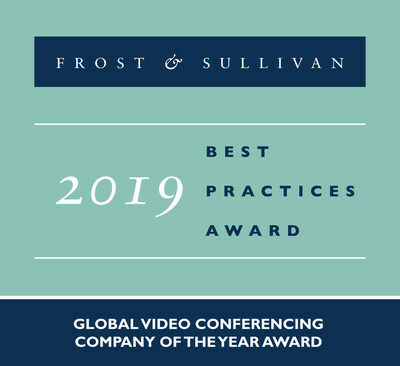 SANTA CLARA, Calif., Dec. 6, 2018 /CNW/ -- Based on its recent analysis of the global video conferencing market, Frost & Sullivan has recognized Zoom Video Communications, Inc. with the 2019 Global Company of the Year Award for its simple yet high-quality video conferencing cloud service that is changing the way business users communicate. Zoom's easy-to-use and reliable video conferencing solutions make business video and web conferencing simple and enjoyable. Due to its rich user exerience (UX), Zoom users are increasingly opting for video conferences over the less engaging and less effective audio-only meetings. "Zoom has led the industry migration from hardware-based, expensive, network-dependent solutions to cloud video communications that enable high-quality video experiences," said Roopam Jain, Industry Director, Connected Work practice at Frost & Sullivan. "Its end-to-end portfolio of services unifies video conferencing, online meetings, group messaging, digital signage, and a software-based conference room solution into a single platform. This approach offers a simple and consistent UX across all meeting spaces including desktops, executive offices, open spaces, huddle rooms, large conference rooms, and mobile devices." Due to the strength of its solutions and its unwavering focus on user exeperience and customer happiness, Zoom has grown at a rapid pace since the launch of its first product five years ago. In 2018, it has logged more than 45 billion annualized meeting minutes. Not only that, Zoom has been leading the industry with many innovations. The company takes a measured approach to product development and only adds featuresthat offer value without compromising usability. It understands the critical role that Artificial Intelligence (AI) will play in making meetings smarter and intuitive, and eventually predictive. Consequently, it launched a machine learning-based transcript recording feature that creates accurate, searchable, speech-to-text transcripts of meetings and webinar recordings. It also recently launched an improved virtual background feature that enables users to display an image of their choice in the background during a video call without requiring a green screen, which ensures a distraction-free call. "Zoom's success is in large part due to its strategy of partnering with the best technology companies in the industry. It has strategic partnerships with numerous technology companies such as AVer, IBM, Intel, Logitech, Polycom, and Yealink," noted Jain. "These collaborations have allowed it to seamlessly integrate its solutions with a broad spectrum of best-of-breed communication devices and third-party software that enhance core workflows and business processes." About Zoom Video Communications, Inc.
Zoom provides easy, reliable cloud platform for video and audio conferencing, collaboration, chat, phone system, and webinars across mobile devices, desktops, and room systems. Founded in 2011, Zoom helps businesses and organizations bring their teams together in a frictionless environment to get more done. Zoom Rooms, the software-based conference room solution, features video and audio conferencing, wireless content sharing, and calendaring running on off-the-shelf hardware. Zoom Rooms suit any meeting or collaboration space, from huddle rooms to training centers. Zoom is a private company headquartered in San Jose, CA. Visit zoom.us and follow @zoom_us.